Camping is all about enjoying the outdoors and finding time to relax away from our typically busy lives. When you really want to disconnect, the best way to do it is dry camping. Also called “boondocking,” dry camping is when you take your RV somewhere away from the typical stations and hook-ups of designated campgrounds. Without the amenities of the campground, it’s important to know how best to conserve your water and electricity to fully enjoy your trip without running into problems, especially if you’re traveling with pets. 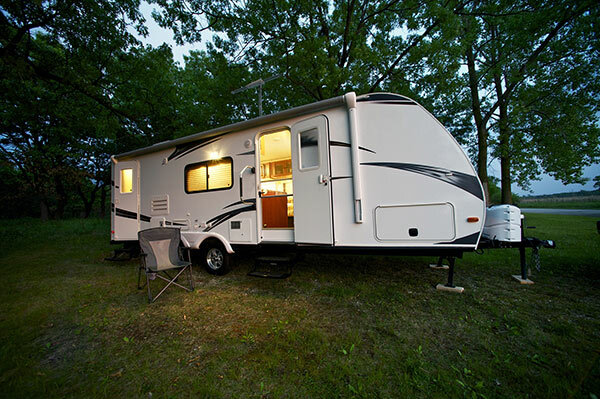 Read our RV boondocking tips to learn great ways to maximize your dry camping outing. Never waste a drop. If you’re running water, make sure it goes to good use. Instead of running water to get it warmed up, collect the initial running water in a pot to heat up on your stove. Make sure to bring some containers that fit in your sink that you can fill with soapy water and rinse water. Use these to clean your dishes so that you can get them all done with a small amount of water. You can also let soapy dishes drain briefly to reduce the amount of rinsing required to get them spotless. When water is scarce, showers can be a huge waste. Don’t leave the water running if it doesn’t need to be. Turn it on for a quick rinse, then turn it off to soap and scrub. Turn it back on to rinse again. You can drastically minimize the amount of water you use to shower this way – especially if you’re quick. While your standard RV water pump may work just fine for typical usage, you may benefit from a higher-grade pump for dry camping. A higher-quality water pump can improve water pressure even with lower water flow, and can ultimately let you do more with less – which should be your boondocking motto. Any device that can be replaced with a manual version is energy you won’t be wasting. Kitchen tools like manual coffee grinders or egg beaters can save you a lot of power in the long run. It’s worth looking into what you use often, and trying to find out if there’s a way to accomplish the same tasks without using electricity. There are always some things your family might not want to do without, such as a tablet or computer, but for anything else, it’s worth focusing on conserving energy. If the whole family is coming along, you may want to plan for some fun RV activities for your child that doesn’t involve a gadget too! Battery operated clocks will let you keep track of time without plugging in more unnecessary tools. But that’s just the beginning. Consider buying a few cheap LED touch lights – they cost a few dollars at most. These tend to have strong adhesives that let you stick them wherever you like. Put them in areas where you need a small amount of light and use them whenever necessary. Any device that’s running on replaceable batteries will save your primary batteries for more important jobs. Inverters use standby power, sometimes known as “vampire draw” or “phantom load.” That means even if it’s not in use, but it’s plugged in, it’s drawing power. When you’re boondocking, every watt counts. One crucial RV boondocking tip to remember is that inverters aren’t 100% efficient. If you need to push 80 watts of power through an inverter, it will take about 100 watts to do it. Try to avoid using inverters when you can. If it’s exceptionally hot, do your best to stay out of the trailer during the day to enjoy the area you’re camping. Trying to cool the trailer for long stretches of a hot day will significantly hurt your energy efficiency. It’s much easier to find ways to stay cool outdoors, and then vent the trailer quickly when you return. When it’s cold, remember to pack blankets and dress in layers. Keep wrapped up instead of trying to heat the whole trailer. If you absolutely have to, make sure to only use as much heat as you need. Remember that trailers heat up quickly, and overusing any energy source will mean a quicker end to your boondocking experience. If you need to pack some tech, consider a tablet instead of a laptop. They use less energy and can be charged without using an inverter. Moreover, they’ll take up less space on your RV, which is just as precious a resource as energy. While a tablet won’t be able to do everything a laptop can, if it does the things you need, it’s the better option. For watching movies, playing games, or reading, stick to a tablet. Dry camping is all about having the right resources for your expedition. In addition to practicing good conservation techniques, it’s important to pick an RV that’s suitable for boondocking if it’s something you plan to do. While it’s true that any RV can dry camp, it all comes down to how you intend to dry camp and what you need to accomplish it. Both fresh water and gray tank capacity is important when it comes to dry camping. You don’t want to get stuck somewhere without fresh water, so it’s important to know how much you consume on average to find an RV that can support an adequate amount. Likewise, disposing gray tank wastewater appropriately is easy when you have the capacity to hold all the gray water you need before reaching a dump station. You can be perfect when it comes to conserving your battery power, but if you don’t have enough to meet the bare minimum of a short-trip, it really limits your dry camping potential. Consider an RV that has a rack suitable for two batteries, and look into high-quality deep-cycle batteries. The more power you have, the longer your stay! And if you’re driving a luxury RV packed with amenities, you’ll need as much power as you can get. While there’s no such thing as one-size-fits-all for RVs, and even small RVs are great for dry camping it is important to find a trailer that suits your needs. If you’re planning to boondock with two or four people, make sure your trailer has ample storage and room. Since you’ll likely be trying to get away from the normal campgrounds, you’ll want to have everything you need in the RV. Find more tips for dry camping efficiently. Download the RV Boondocking Tips Sheet!